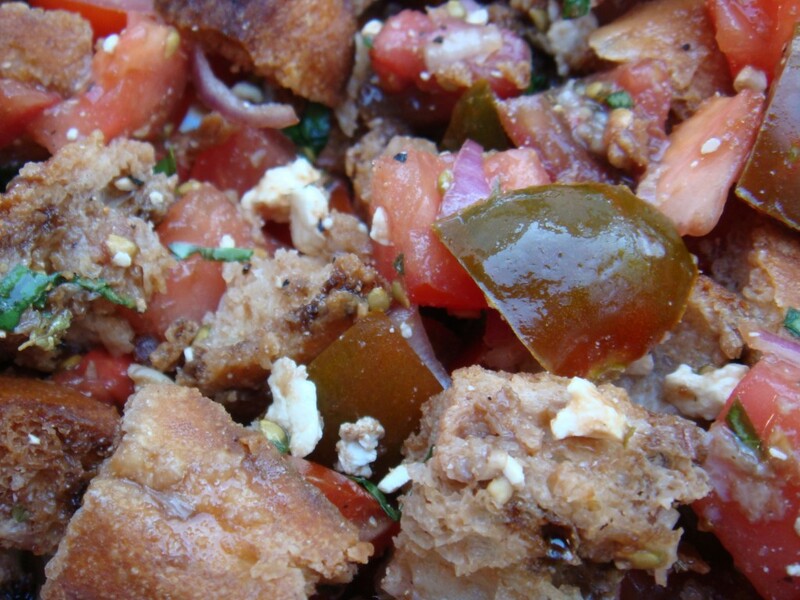 Grilled Bread and Tomato Salad — and it’s Weight Watchers!!! Not only was this past weekend the 4th of July holiday, it was also a scorcher. When it’s this hot outside, the last thing on earth you want to do is eat something heavy. So, here is a recipe for a salad that is amazingly delicious, light, tasty and showcases one of summer’s favorite staples… the tomato. I LOVE tomatoes. I grow several varieties in my backyard every year. I have a TINY lot… living just inside the city limits of Boston. But, I still have 12 varieties of heirloom tomato plants out there! Now, my tomatoes aren’t quite ready yet, even though I was able to pick 4 small, green-striped ones the other day… I still have them sitting on my counter ripening. Anyone know how to tell when a green tomato is ripe??? This is my first year growing them and I’m still trying to figure that one out!!! I actually found this recipe on the Weight Watcher’s website. Yes — me, a “foodie” is trying to do WW. This is the end of my first week… I had my first weigh-in today… I was down about 3 pounds. Woo hoo! Anyhow, when I saw this salad on the website, it immediately caught my eye because it looked SOOOO good and it had grilled bread in it!!! Um…. SOLD! I made a few changes to it, to adjust to my tastes and the ingredients I had on hand. But, my alterations should not have changed the points too much (WW lingo). In a large bowl, combine tomatoes and onions. Drizzle on olive oil, balsamic vinegar, a few grinds of salt and a few grinds of pepper (to taste). Sprinkle on oregano and toss to combine. Let stand. Take sliced bread and coat each cut side with cooking spray. Either grill or toast the bread until browned. This takes about 2 minutes. Remove bread from heat, cut the garlic clove in half and rub all cut sides of the bread with the fresh garlic (cut side). Either break or cut the bread into bite-sized pieces. 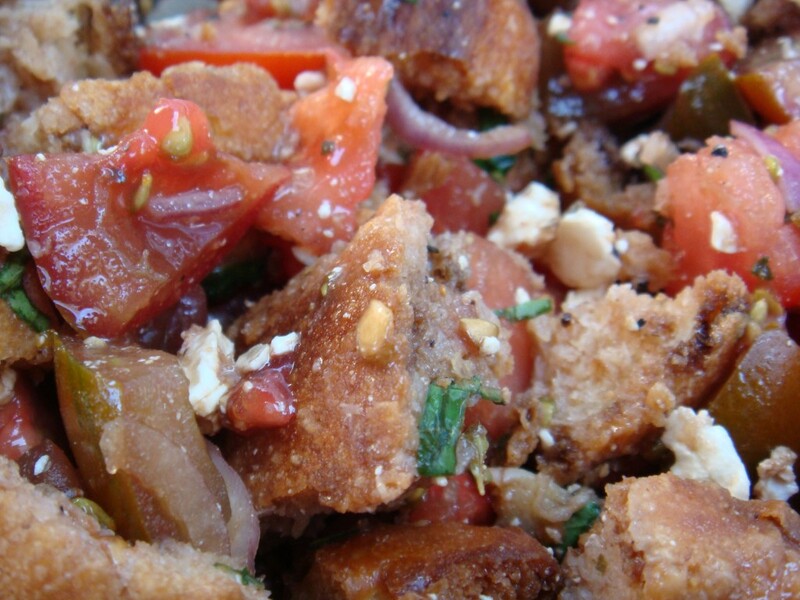 Just before serving, toss the bread (and the feta cheese) and shredded basil with the tomato-onion mixture. Mix to coat. You do not need to measure out the seasoning. Use your eye… just don’t overdue the salt. Season to your liking! You also do not really need to measure the vinegar. If you are following the WW program, vinegar is 0 points anyway. I like using the balsamic glaze b/c it adds a sweetness to this dish. Feel free to use any vinegar you like. I’ve added capers to this dish and it’s tasted great. You could easily add fresh mozzarella or shredded chicken to make this a more satisfying meal. Just adjust the points appropriately. This salad was a HUGE hit. Be prepared to share the recipe!